Advantage Healthcare Systems was established as a response to an ongoing need for additional multidisciplinary rehabilitation centers. Our facilities are located in key areas around Texas with our main locations in Dallas, Fort Worth, and San Antonio. We have been serving injured individuals from around the world and assisting them to a higher level of function and return to work. It is our mission to improve the quality of life for our patients by emphasizing abilities, minimizing disabilities, and encouraging prevention, health, and fitness as a way of life. Advantage Healthcare Systems provides highly skilled physicians, therapists, and technicians to meet the individual needs of the patients we serve. To be the Best Healthcare System in the world. 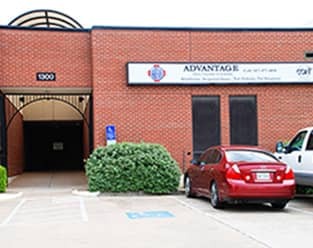 Advantage Healthcare Systems has been serving injured workers since 1983 and has been located in the DFW community since 1989. We are accredited by the Commission on Accreditation of Rehabilitation Facilities (CARF) in medical rehabilitation for chronic pain management (outpatient), work hardening, and work conditioning. You can expect caring, courteous professionals, quality treatment, and convenient, friendly service. Advantage Healthcare Systems’ services are priced competitively with physicians’ offices and are less expensive than hospital emergency department charges. We accept state Workers’ Compensation, federal Workers’ Compensation, most health plans, letters of protection (attorney), VISA, MasterCard, cash, or check. It would be a great pleasure to serve you and your patients.